Imagine a world where you can just swipe a card or touch a button on your mobile phone to buy a bus ticket or to pay toll at a toll booth or to make a payment at a merchant counter. If the Reserve Bank of India's Vision Document on Payments and Settlements System is to be believed all this might become a reality by 2018. The Reserve Bank of India (RBI) on 23rd June 2016 released the “Payments & Settlements in India: RBI Vision-2018”. The vision reiterates the aim of building a “less-cash society” by encouraging greater use of electronic payments by all sections and to make regulations more responsive to technological developments and innovations in the payment space. The objective is to ensure that a robust payments infrastructure is established in the country to increase accessibility, availability, interoperability and security. The RBI has periodically put forth its vision for payment and settlements systems in India, which enunciates the Bank’s objective to migrate to electronic payments and to ensure that the payment systems in India are safe, secure, authorised, efficient and accessible. The previous vision document covered the period of 2012-2015. The broad contours of Vision-2018 revolve around 5C’s – Coverage, Convenience, Confidence, Convergence and Cost. Coverage: Enabling wider access to a variety of electronic payment services. Convenience: Enhancing user experience through ease of use and of products and processes. Confidence: Promoting integrity of systems, security of operations and customer protection. Convergence: Ensuring interoperability across service providers. Cost: Making services cost effective for users as well as service providers. Responsive Regulation: Involve all stakeholders to promote twin objectives of enhanced coverage with interoperability of the payments system and convenience with security for the end-users in sync with emerging developments and innovations. Robust Infrastructure: Aim is to increase the accessibility, availability, interoperability and security of the payment systems. Effective Supervision: Includes designing a framework for oversight and improving the monitoring mechanisms for fraud. Aim is to strengthen the resilience of the Financial Market Infrastructures (FMIs) and System Wide Important Payment Systems (SWIPS) in the country. Customer Centricity: Includes streamlining the customer grievances redressal mechanism, improving customer awareness and education, and initiating customer protection measures. Continued decrease in the share of paper-based clearing instruments. Consistent growth in individual segments of retail electronic payment systems vis. NEFT, IMPS, Card transactions, mobile-banking, etc. Increase in registered customer base for mobile banking. Significant growth in acceptance infrastructure. Accelerated use of Aadhaar in payment systems. 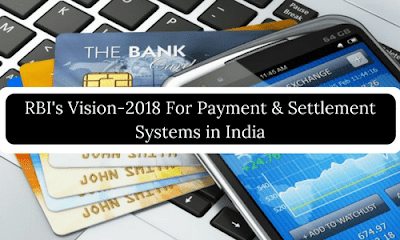 With increasing use of technology-based innovative payment products, the strategic initiatives under Vision-2018 are expected to reduce paper-based instruments significantly. It will lead to accelerated growth in mobile banking and other modes of electronic payments.